I first wrote about Text Cleaner way back in 2007 on this blog. 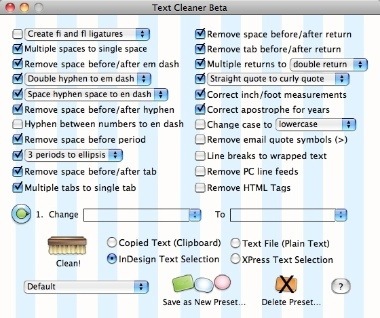 Text Cleaner is a cool Macintosh program that makes it easy to "clean" text of multiple spaces, double hyphens, multiple tabs, line breaks, etc. It's a standalone application, but will clean the text you have selected in InDesign, InCopy or Quark without screwing up the formatting. Alas, this handy app was never updated to work beyond InDesign CS2. But I just received notice from the developer that they've finally updated it to work with InDesign/InCopy CS3 - CS5.5, as well as Mac OSX 10.4 to 10.7. You can download the pre-release version here, which is free and will work until 10/1/2011. I really like this app, and used it heavily back in the days of InDesign CS2. In addition to working with text in InDesign, InCopy and Quark files, it will clean text on the clipboard or in a text file. An alternative to Text Cleaner is the excellent Multi-Find/Change for InDesign from my friend Martinho da Gloria. This cool plug-in lets you string together and save sets of multiple InDesign find/change queries for quick recall. Highly recommended also!